The Pestana Carlton Madeira Hotel is on a cliff top with good views across Funchal Bay and a 10 minute walk from the resort centre. Hotel guests have direct lift access to the Atlantic Ocean. Funchal is a good mix of old and new with 16th century architecture sitting alongside the more modern developments. The marina and Lido are popular areas, as are the many gardens and markets. 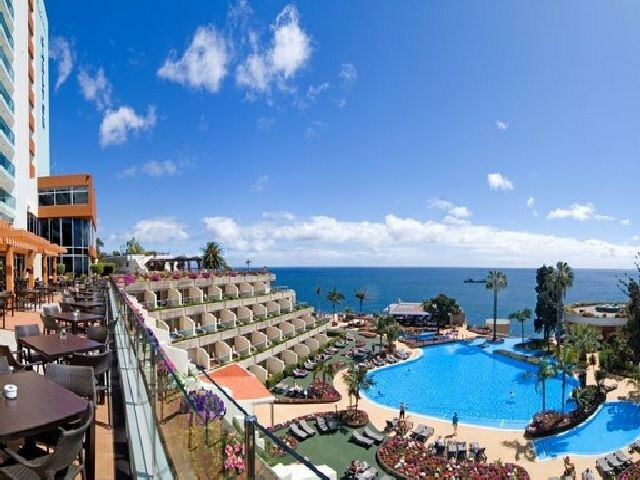 The Pestana Carlton Madeira Hotel in Funchal will appeal to couples and families looking for a high standard of accommodation and a wide choice of facilities for the best in holiday relaxation. The hotel has 2 salt water swimming pools, one of which is heated and at sea level with direct access to the sea. There is also a separate children`s pool . The indoor pool is located on the second floor. The hotel has 2 restaurants, 3 bars and a pub serving hot and cold snacks.